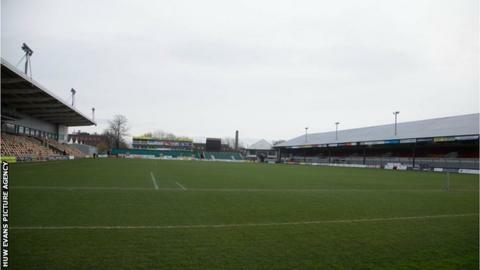 Newport County chairman of operations Gavin Foxall says he expects the League Two club to remain at Rodney Parade. Fellow tenants Newport Gwent Dragons are subject to a takeover bid from the Welsh Rugby Union, who have said they see Rodney Parade "as a rugby venue." County have a lease to use the ground - and have primacy of fixtures on the venue if they remain in the Football League - until 2023. "Our view is quite clear - we've got a contract," Foxall said. "That is something that we're expecting to be honoured. "Obviously there is a vote in early May by the shareholders for Newport Rugby and we'll wait and see what happens with that." The WRU's takeover of Newport Gwent Dragons will be put to the vote on Tuesday, 9 May. In 2013 the Exiles agreed a 10-year lease to use the stadium after gaining promotion to the Football League from the Conference. Newport RFC chairman Will Godfrey said both County and Newport Squash Club, who are also based at Rodney Parade, are protected under their current agreements. Godfrey said the WRU had been made aware of that fact. The WRU have signalled their intention to install an artificial surface which is against Football League rules. On the pitch, County are two points clear of the League Two relegation with two games remaining after six wins in 10 games under caretaker manager Mike Flynn and can clinch survival this weekend if they win and rivals Hartlepool lose. "To lose that status again, in a relatively short space of time would be pretty devastating for the fans but also for the city of Newport," Foxall told BBC Wales Today.